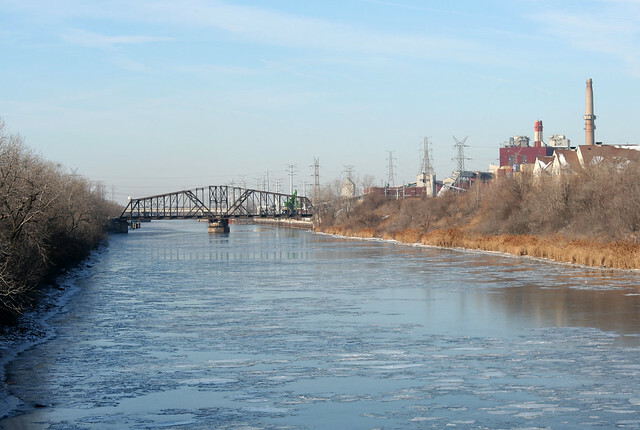 The Chicago Sanitary and Ship Canal has the least appealing name imaginable, but it draws interest for its remarkable history – as a feat of engineering, as a center of industry, and as a major geographic feature for southwestern Chicago. It is one of those rare elements that truly disrupts the marching grid of Chicago’s streets. 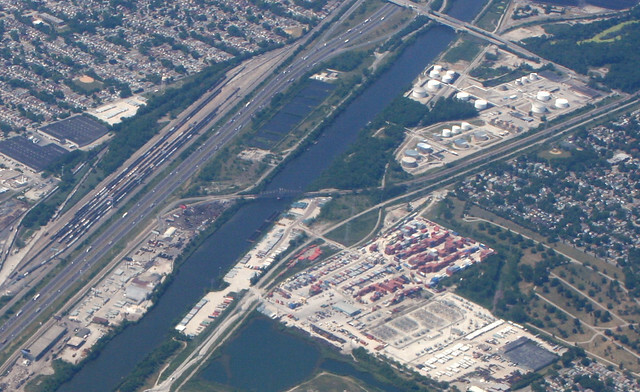 The Sanitary and Ship Canal from the air, with railroads, industry and the Stevenson Expressway alongside. Railroads, of course, are fewer in number than roads, and also heavier and less agile. 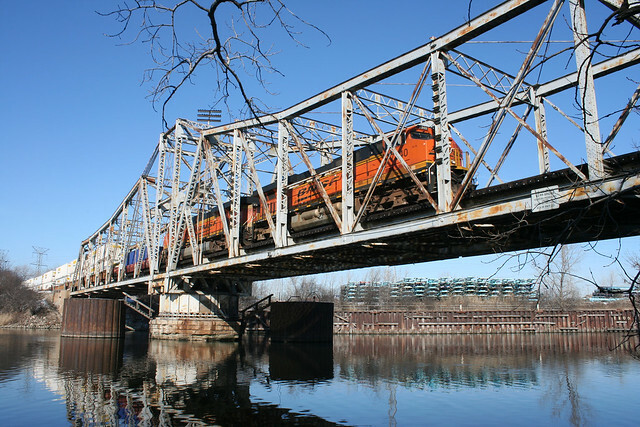 The result is that a large number of remarkable railroad bridges cross the Sanitary and Ship Canal – all of them originally designed to move for ship traffic when needed. With one major exception, movable bridges over the Chicago river and its associated canals fall into two groups: lift bridges, where the bridge raises into the air, and swing bridges, where the bridge rotates out of the way. Today, we’ll visit a few of the swing bridges. Almost none of the canal’s movable bridges remain operable today; many have had their machinery removed. This raises a curious question: when was each bridge last opened, and which one was shut down first? Deactivating a single bridge would essentially restrict boat height for the entire canal to the maximum clearance of that bridge. At what point was the canal judged no longer important enough to require maintenance of the bridges? 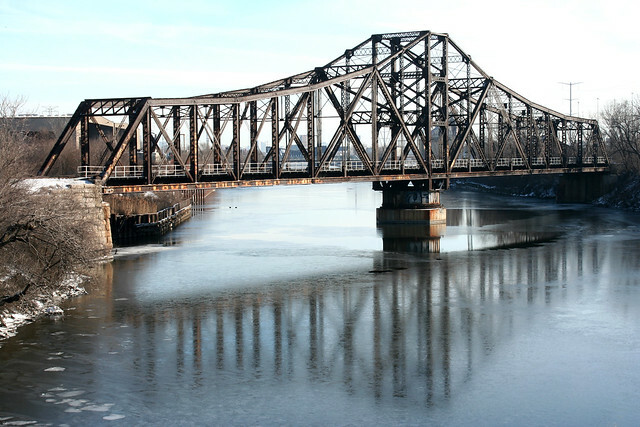 Now owned by the Santa Fe’s successor BNSF Railroad, this swing bridge sits perhaps a quarter mile northeast of Harlem Avenue and still sees frequent traffic. The Historic American Buildings Survey Engineering Record dates it to 1899, when the first segment of the canal was constructed. This bridge appears as the opening image of Wikipedia’s page for the canal – standing high and dry, before the canal had been opened and filled. 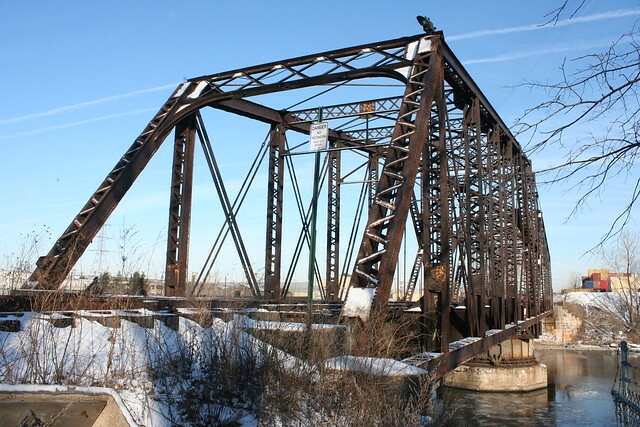 The least accessible of these bridges, the Cicero rail bridge is another swing-span bridge with a mid-stream pivot, built in 1899 as part of the canal’s construction. In the view above, the Ciero Avenue road bridge is visible beyond the rail bridge. 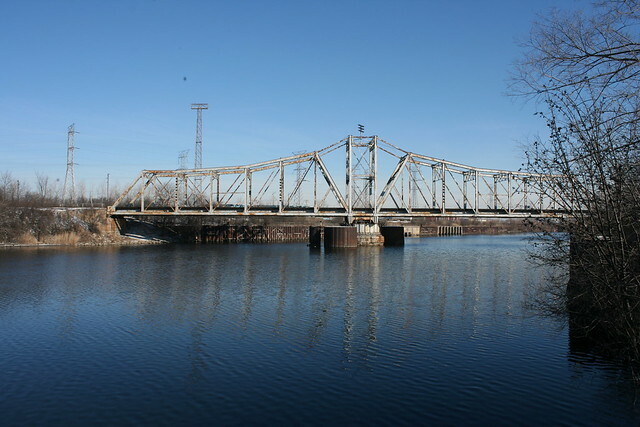 Sitting north of Pulaski Avenue, this is another original 1899 bridge that dates to the canal’s original construction. It is a two track bridge; only one track remains, and that one sees only occasional use. 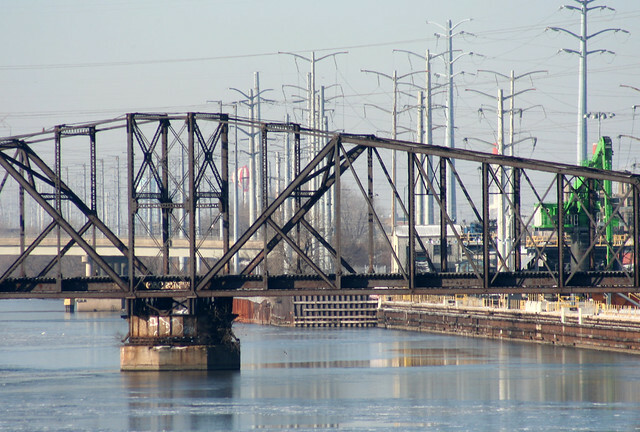 Originally built for the Chicago, Madison & Northern Railroad, this bridge stands just north of Kedzie Avenue and crosses the canal at a sharp angle; in fact, the tracks cross over Kedzie itself just a hundred yards or so later. 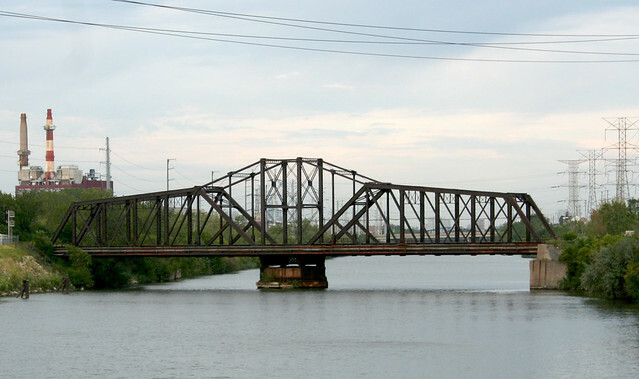 The Kedzie bridge is another swing-span bridge with a center pivot point; it has a more substantial central framework than its neighbors to the south. 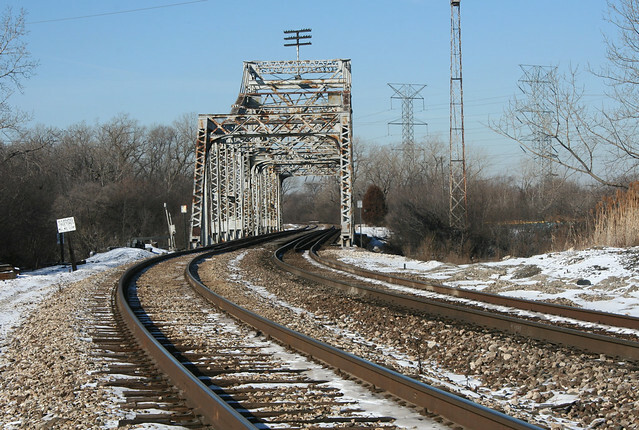 This two track bridge remains in heavy use today. This entry was posted in industry, Rail Bridges. Bookmark the permalink. The Coast Guard probably ceased to require the CSSC to be navigable in 1959, when the St. Lawrence Seaway opened. 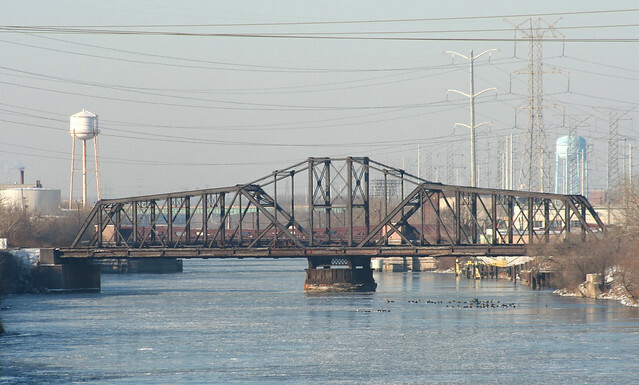 According to one of Forgotten Chicago’s bridge pages http://forgottenchicago.com/features/railroads-and-chicago-swing-bridges, the last time swing bridges like the Chicago, Madison & Northern bridge opened was in 1953, for delivery of the last of several US Navy minesweepers built by shipbuilders H.C. Grebe & Co., located on the North Branch of the Chicago River. It’s important to remember that until 1959, the only way an oceangoing ship could reach the ocean from the Great Lakes was via the combination of the Chicago River & Ship Canal system, the Illinois River, and the Mississippi. If there was no industry along the CSSC requiring either lakers or oceangoing ships, there was probably no one bridge to be shut down first. The Korean War ended in 1953, and a lot of demobilization occurred at that time. It is entirely possible that all such bridges on the CSSC were, at sometime between 1953 and 1959 inclusive, graced with the USCG/33 CFR 117 notation “need not be opened for the passage of vessels” en masse.